Racing Strengths: ITT, long sprints and just going hard. Ardennes Challenge Stage2 2nd 2014. Goals for 2016: Win and NRC/NCC event. Top 5 at US Pro TT Nats. Personal Hobbies/Interests: Surf, skate, photography, adventuring/exploring. First Bike: My dads custom build steel frame Ed Liton. Thing was a tank, weighed in at 24lbs! Favorite Training Ride: Monterey Peninsula Saturday Morning Ride. Favorite Race: Paris Roubaix or De Ronde. 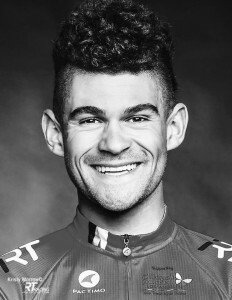 If you could race any cyclist (dead or alive) who would it be and what discipline: Id race Peter Van Petegem over the cobbles of northern France. Toughest race you’ve done and why: Paris Roubaix U23 in 2012 and 2014, and because its full gas for 5 hours! What cycling accomplishment are you most proud of? Nothing I am really smiling to big about… Just trying to build my name and person so that when I retire people will remember me for all the right reasons.